Sports medicine is the science of treating sports-related diseases and the study of enhancing sporting performances. Largely it deals with sports injuries, diet in sportsmen and development of techniques to improve performance. The qualities required in a sportsman are strength, speed and endurance (stamina). These qualities are honed by vigorous training in the field, strict mental discipline and correct balanced nutrition. It is the latter that we are going to deal with in this chapter. A sportsman, however hard he works on his event, will not achieve his goal unless he is supported with the right kind of nutrition,both qualitative and quantitative. A sportman is considered to be under severe stress, both physical and mental. This combination of physical and mental stress does a lot to disturb the milieu intereur by releasing several hormones in very large quantities. The combination of extreme physical activity, severe mental stress, increased metabolic demands of the body associated with a high level of hormones in the blood creates a rather delicate situation which has to be balanced precisely to prevent a break down of the system. Simply stated - proteins, carbohydrates, fats, minerals and vitamins along with trace elements and micronutrients are needed. However, the nutrition of a sportsman is not so easy. These ingredients are required in very large quantities and this puts immense pressure on the digestive and assimilative processes and imposes a great strain on the elimination processes. This strain makes it quite possible for some link in the intricate metabolic chain to snap. All this indicates that the food must be very carefully selected so as to be adequate in quantity, appropriate in quality and of minimal toxic value. Generally it is said that a sportsman requires 2 gm/kg of Ideal Body Weight. This dictum is not always true in every case. Individual variations are always to be accounted for. Protein sources are indicated in Table I.
Pulses are deficient in amino acids which are present in cereals. Thus protein of cereals help supplement that of pulse and thereby improve the chemical score. A combination of nce and dal has a better quality of protein than either of them alone. The protein should not only be in abundance but it should also be utilizable by the body. It should be rich in essential amino acids which are the main building blocks of our body proteins. Furthermore, the availability of the protein should not be offset by the disadvantages imposed by putrefaction of the protein sourcethus imposing a toxin load and stressing elimination processes. In this respect (Ref. Chart I), cottage cheese (paneer), cheddar cheese, indigenous traditional cereal pulse combinations and milk products like curd and butter-milk are far superior to meat and fish. The latter, non-vegetarian sources of proteinthough being individually far superior to vegetarian sources of proteinoffset this advantage by fermenting and putrefying in the gut and releasing toxins which are not easily eliminated. They should constitute 50% of the calories consumed daily. The sources of carbohydrates are fruits, vegetables, rice, wheat etc. These should be in the natural form preferably because in the natural form they are in combination with the appropriate vitamins which act as co-factors in their metabolism. Furthermore, natural carbohydrates are preferred to refined carbohydrates e.g. refined wheat and white sugar because the natural carbohydrates are closely enmeshed in the fibre of the parent food substance, in this way retarding their absorption and thus avoiding large fluctuations in blood sugars. These are essential for the integrity of the body. For example metabolism of various vitamins (A,D,E,K), immune function, nerve myelination, repair of the body tissues and as a source of energy during periods of high demand associated with starvation (as in the marathon runner). 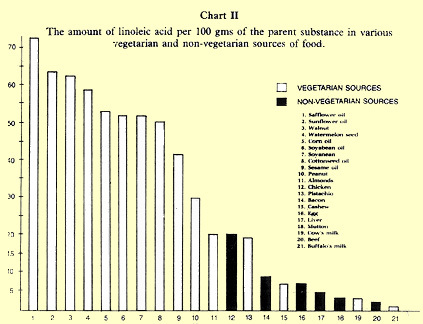 In fats, of particular importance are essential fatty acids - viz. Iinoleic acid, linolenic acid and arachidonic acid. These are essential to the body, as their names indicate and are found in corn oil, almonds, walnuts, cashewnuts, and the kernels of apricots and other substances (see Chart 2). Weight for weight, the vegetarian sources of fats and fatty acids are far superior. These are required in abundance and are very sensitive to heat, cold, processing, storage and dehydration. Hence, in theory some foods may contain this ingredient but due to cooking and or storing processes it may no longer be present e.g.skimming milk takes away the vit. D, the fat and fat soluble nutrients and thus the most important elements of milk are lost by skimming. These are present in abundance in fruits of the season, fresh vegetables, nuts and other natural vegetarian food. These are an ever-increasing list of substances necessary for metabolism and are available mostly from raw vegetables. These are needed in fair amount for both strength and bulk of muscles and are essential to sportsmen who undertake events like football, rugby, shotput, wrestling, boxing, etc. Vegetarian sources of protein are superior to non-vegetarian sources in that they contain all the necessary ingredients and in their utilizable forms. 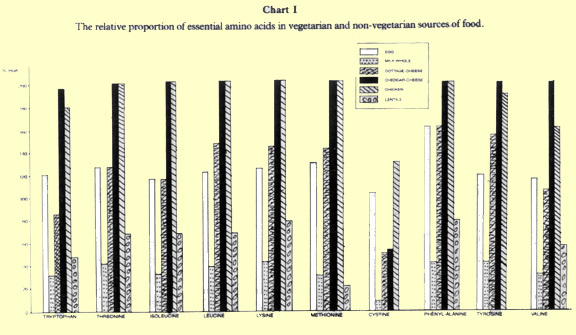 Due to the increased toxin load of non-vegetarian protein sources, their superior biological value is rendered less advantageous (in terms of net advantage) (Chart 2). These are fuel source for athletes wanting speed,as in short distance running, swimming and in fast field games like hockey, football, etc. The carbohydrate sources are rice, fruits, some group A vegetables like carrots, beetroots, potatoes, wheat to a certain extent and honey to a large extent. Non-vegetarian foods do not feature in this category at all. The most superior source of carbohydrates for stamina in sports is Honey which is quickly converted to glycogen and stored in the liver. This store of glycogen builds up rapidly because of the presence of all the vitamins and minerals present in honey. In India, rice and wheat are the main source of carbohydrates and this should be backed solidly with a fair share of fruits and their juices. Even though white sugar and glucose powder are vegetarian sources of food, they are detrimental to sportsmen because these substances decrease the pH of the blood, cause demineralisation of bone and 'steal' vitamins from the liver for their metabolism. The fats from vegetarian sources have the advantages that they contain poly and monounsaturated fatty acids and essential fatty acids whereas meat like beef, pork, mutton contain largely saturated fatty acids which are detrimental to health. These are essential for the thousands of reactions in the body taking place in practically every organ. For instance calcium and potassium are essential for muscle function. Calcium and phosphates are essential for the strength and resilience of bones. Sodium chloride is essential for the maintenance of blood pressure and vitamins and minerals act as co-factors in practically every metabolic reaction of the body whether it be the conversion of glucose to glycogen or burning of fats to obtain energy. A slight deficiency of these constituents can prevent an athlete from achieving his maximum potential. It is clear from the data above and the illustrations that the nutrition of an athlete is not simply an 'eat-more' phenomenon. The quality is as important as the quantity, if not more. The timing of food and the changes of 'in-season' and 'off-season' nutrition are extremely important because that helps athletes to build up their reserves during off-season and hence have them prepared for in-season, high level energy expenditures. After observing the effects of putting young school athletes on a balanced vegetarian diet, I am convinced that in order to perform well in any sport it is not necessary to haves a predominantly non-vegetarian diet. In April, 1988, 60 athletes ranging from 9 to 16 years in age were counselled on vegetarian diets. Their performances were monitored throughout the year upto the competitive season. It was noted that these athletes had all improved as compared to previous years' performances. Many were convincing winners in their events. This however, has been an informal, nonrandomised study. The results are quite evident that, it is not necessary to have a predominantly non-vegetarian diet in order to perform well in sports. The subject of vegetarianism has been a topic for hot debate ever since the ancient Greek athletes. Various theories were put forward perpetuating the 'veg'-'non-veg' tug-of-war. The vegetarian cause has been amply supported by many athletes. The athletes who excelled in cycling, long distance walking, marathon running, swimming, tennis and other athletic events like short and middle distance running,could perform these feats not only because they set their rrind to it, but because a vegetarian diet has every thing that a sportsman needs. In modern times many athletes have changed over to a vegetarian diet pattern. Prominent amongst ffie celebrities is Martina Navratilova who has dominated the world of tennis for so many years. Many more athletes are changing over and more will, in future. From the data presented, it is simple to note that for every need of the athlete there is an adequate vegetarian source. Hence it is not mandatory, as is widely believed, that for an athlete to be successful he must have a non-vegetarian diet. A carefully planned vegetarian diet can be as nutritious, if not more, for a sportsman.